A nice example of genealogical good fortune came my way as a result of a past blog post I wrote regarding my search for family photos. Years ago I traced the genealogy of my great-grandfather’s namesake. 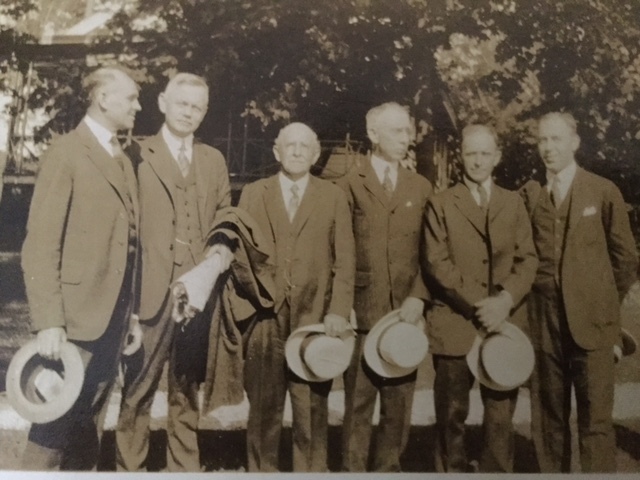 The closest way that William Porter Chapin and Henry Thurston Child were related was, as stated above, as second cousins: their maternal grandmothers Almira (Kendall) Morse and Tryphena (Kendall) Lyon were sisters. 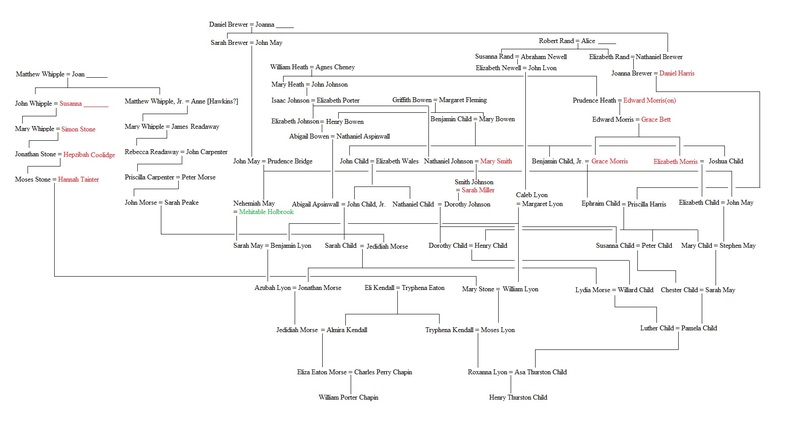 However, in going back in the ancestry of William’s mother and of Henry T. Child, I realized these two families were related a lot, in more ways than one. Chapin happened to be one of the few families behind William that was not in Henry’s ancestry. 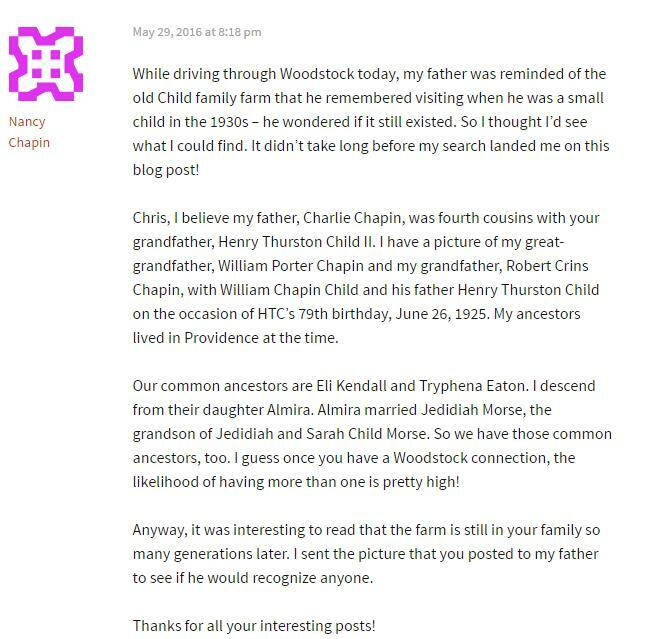 Just looking at the ancestry of William’s mother Eliza Eaton Morse only (his father, Charles Perry Chapin of Worcester, Massachusetts, was not a Woodstock native), and comparing it to the entire ancestry of Henry T. Child within several generations, I realized that 15/16ths of Eliza’s ancestors were also ancestors of Henry T. Child. The only group of Eliza’s forebears whose ancestors were not common to Henry was her great-great-grandmother Mehitable (Holbrook) May. The below picture, provided by my newfound fifth cousin once removed Nancy Chapin – of the two cousins and their sons, including my great-grandfather, William Chapin’s namesake – is certainly one of the most interesting family photographs that has surfaced for me as a result of writing for Vita Brevis. Great story! (Would you please share what program you used to make that very complex chart?) Thank you for sharing. Thanks. I used Paint to make the chart typing every name and drawing all the lines. I have not found any software that can do that automatically. Thanks, Chris. Many of the surnames and at least one couple in your chart are in mine. I only have two Childs in my database (so far), but I descend from original immigrant Samuel Chapin via his daughter Catherine, who married Nathaniel Bliss. (I descend from Nathaniel’s sister Mary, too.) ‘Tis always a tangle of interconnections in early New England! Still waiting to hear how you’re related to Thurston Howell III! What an interesting and fulfilling encounter through your post. I descend from a Morse line but I have to see if any of the ones in your graph can be match to any of the ones in mine. However, I have a question not related to that issue. How do you make the graph that you posted here? Is it from a special program? Do you use “lines and curves” in Microsoft Word? I have never been able to figure out how to do the tree that way. I can only do it with Roots Magic or Family Tree and those cannot be made small enough to send in a letter. I have seen similar charts when comparing Royal lines and trees where people were so often connected for political and economic reasons. If there isn’t an easily used program, there would be a market for it. It would be extremely useful to provide a visual. There is a program called Inspiration that would be very adaptable to this structuring. I’ve done several using Excel. Enjoyed your story and chart. We are very definitely related through my ggggggg grandparents Peter Morse and Priscilla Carpenter as well as 8+ generations back through Matthew Whipple and Anne Hawkins (the Whipples and Hoyts of Malone, New York and Woodstock). Woodstock was a small place. It is not surprising that anytime I read about Woodstock it seems I am related to someone way back! What a fascinating family history! The picture is really a good one. Thanks for sharing. Chris, I really enjoyed your article. I am a Chapin descendent, though from Samuel Chapin through his son Japhet. 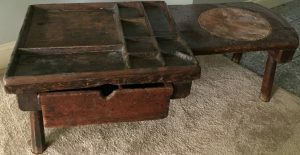 I loved the photo of the shoemaker’s bench. 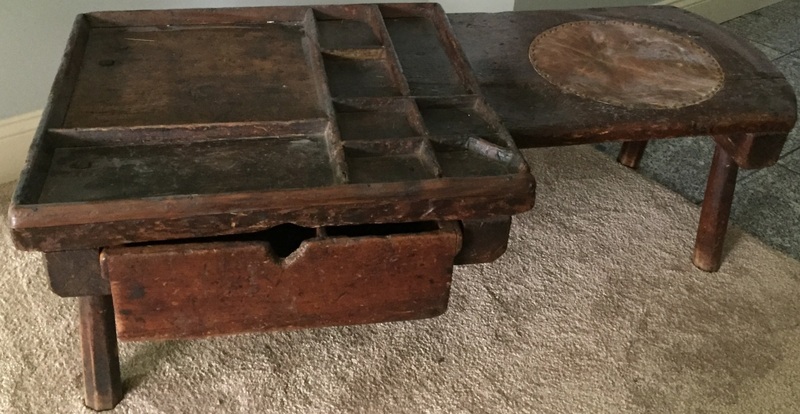 We used to have a miniature one in our home when I was young and I have always been interested in shoemakers (having a shoemaker on another side of my family.) Thank you for sharing. Very interesting, Chris – I am descended from two Child sisters (Abigail & Dorothy, also daughters of Joshua Child & Elizabeth Morris on your chart). These Child sisters married Draper brothers and their offspring continued to marry various cousins within those families. My father descends from one subset & my mother from the other… there are also Chapins & Thurstons (Seth Chapin & Bethiah Thurston, through their son, Samuel). Furthermore, my paternal grandmother (through whom one of those Child/Draper lines runs) was a Glidden. How does one even identify the level of cousin-ness between you and I…? It all depends on which side you look at, but does terminology exist for those multiple levels of relation? I’ve heard of double cousins, but this gets so much more complex – you’re right that a chart is the best way to really see it all. BTW – I use Excel when I put these things together. Thanks Sarah. I also descend from the same Dorothy Child and her husband Ebenezer Draper, that goes down to my great-great-grandmother Ella Eliza (Fitts) Child, wife of Henry T. Child described above. See http://vita-brevis.org/2015/08/the-names-the-same/ for all my unique Child lines. Generally beyond the term of double cousins, I have not heard of further terminology to define such multiple kinships. Thank you for an interesting article and chart. We are related on several lines, as I also descend from Dorothy Child & Ebenezer Draper, the Readaways, Carpenters, and probably many others on your tree. Have you done autosomal DNA testing?